Last time I wrote about the Occasional Home Store we were getting ready to celebrate the start of Autumn (my favourite of all seasons) by holding our first ever Fair, bringing together vintage traders, designer/makers and pop ups of our favourite interiors shops in our little corner of North London. 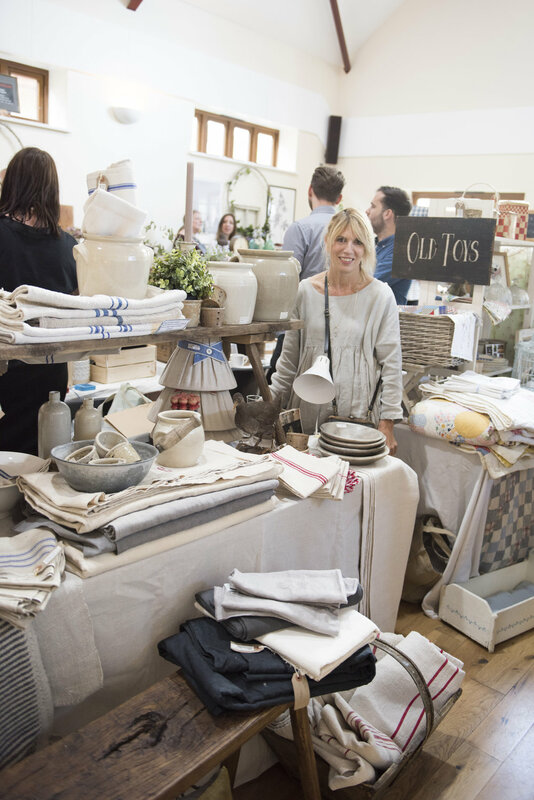 Fast forward 5 weeks and I still can’t believe how many of you lovely people came along last Saturday and saved me from bankruptcy by ensuring that me and my mastercard were not alone in a hall full of the homeware of my dreams. 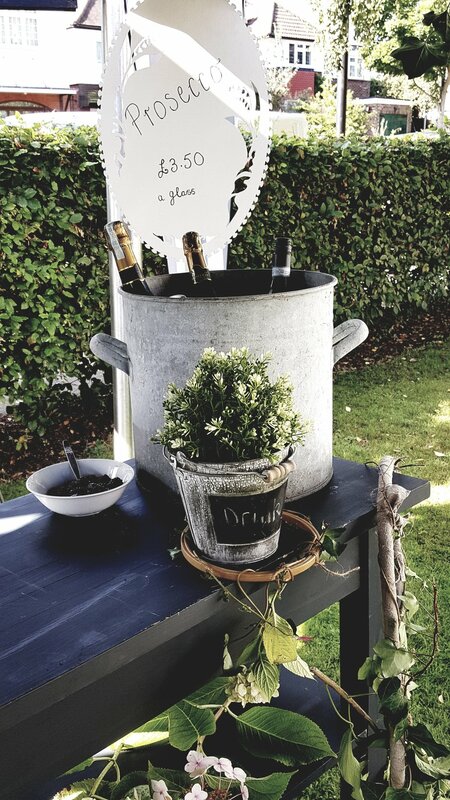 The Glam Camping Co transformed a quiet corner of the Church grounds into a glamorous insta meet up with their gorgeous Strawberries & Cream bell tent. Charly of our lovely event partner Plum & Ashby who, in a lovely piece of serendipity turned out to have been christened in St Peter's Church next door. The day before we opened the Occasional Home Store doors passed in a haze of trestle table transport, chair lifting, hula hoop adornment and stall styling. Although I wish on a daily basis that our car was a nippy mint green Fiat 500 instead of a cumbersome family estate car known as the mobile landfill, I have never been so grateful for its girth and length as the moment when we managed to get our 3 metre prosecco bar in it without even having to resort to securing the boot with string. Really wouldn't have fancied having to transport this on the 329 bus! There was, however, a hairy moment at 11pm on the Friday night when we discovered that we were somehow 6 tables short of the number of sellers we had coming, forcing us to contemplate the possibility that we would have to ask our lovely stallholders to lay out their wares on the church drive Eiffel Tower street hawker style. Fortunately a call to Roy, caretaker of the hall and the most patient man in Britain, revealed that the Vicar's widow had 6 stashed in her garden meaning we could stand down our emergency plans to bring our kitchen tables to the venue as replacements. I am guessing the big guns like Country Living never have to worry about a #VicarsWidowGoneRogue stealing their tables. The relieved but weary faces of Team OHS after the #TableTrauma had passed. Returning home after midnight, our alarms were set very early for the Saturday morning. 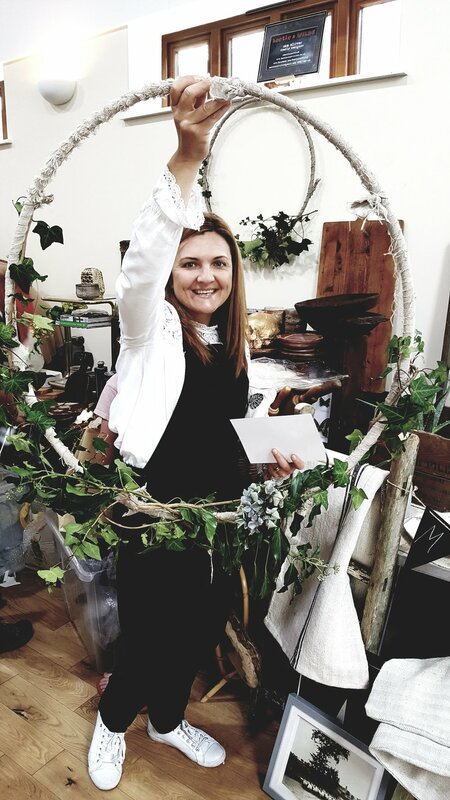 Sally’s so that she could get down to the hall early to ensure all of our outdoor stallholders had a gazebo constructed for them and mine to ensure that I hit the event with absolutely #PeakPebble MillHunnifordHair. Obviously when it rained briefly at 4pm I was giving thanks that Sally had been #GettingsGazebosUp whilst I was #GettingMyBouffantOn. 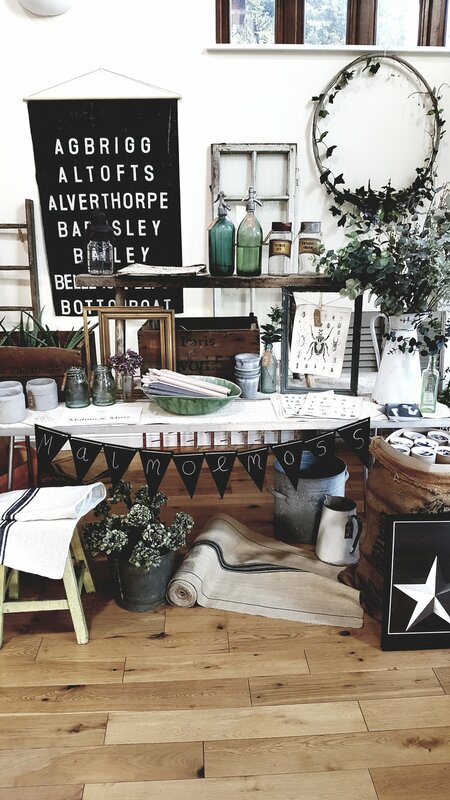 With our friends and family sacrificing their Saturday and the minimum wage to come along and help us out, we were able to transform the hall into a modern rustic shoppers paradise. All credit on this front must go to Beth, who used to edit Selvedge magazine and is insanely creative. If you left me alone with a hula hoop and a pile of ivy you would return after an hour to find me still with just a hula hoop and a pile of ivy. However, in Beth’s hands, those two basic ingredients were transformed instead into a gorgeous rustic decoration that was #straightouttakinfolk. 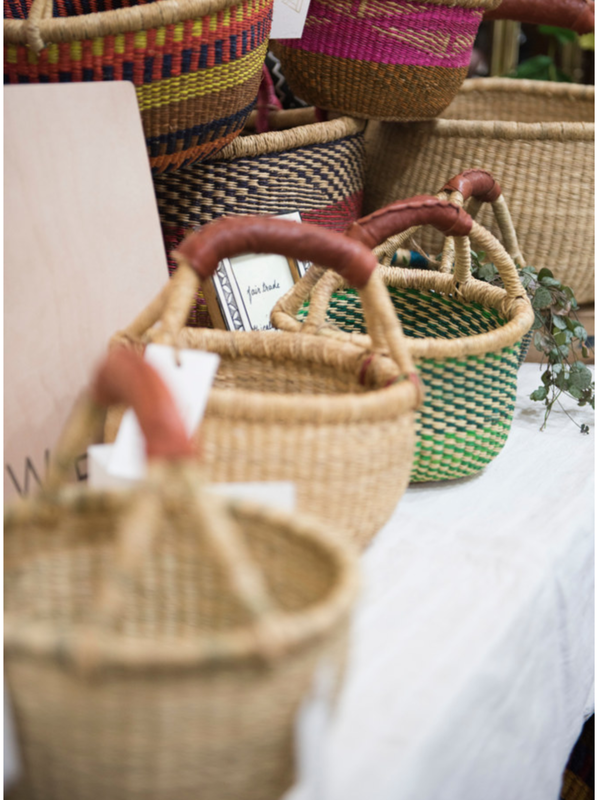 It was amazing to see our sellers arrive one by one and to watch as their beautiful stalls came together. Most of them took a huge leap of faith agreeing to come to an event that had never been held before in a part of North London they had almost certainly never heard of unless, that is, they happened to have been glued to the news in 1998 when former South American Dictator General Pinochet inexplicably chose to seek #ExileinEnfield. 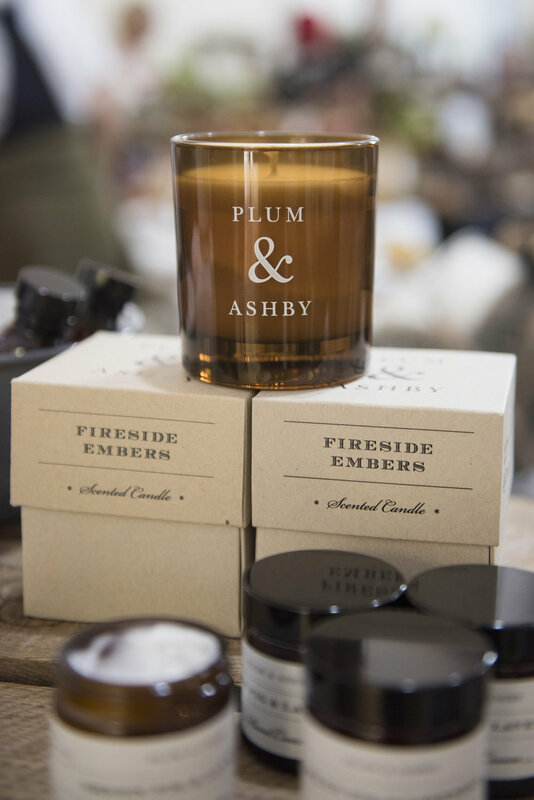 Our profound thanks must also go to the lovely team at Plum & Ashby who did not hesitate to come on board as our event partner and provided so much wonderful support in the run up to the event and on the day. 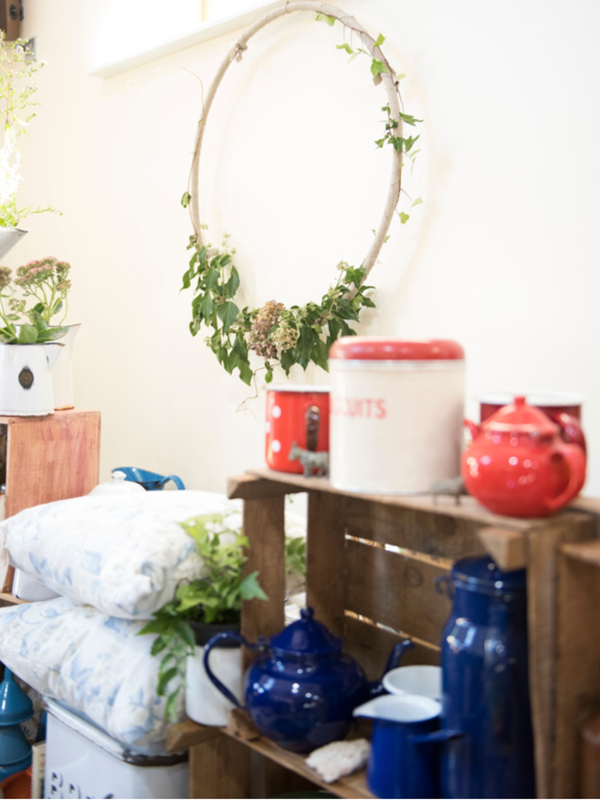 Without wishing to sound too much like #PaltrowinPinkTaffeta huge thanks must also go to Annie Sloan and Essential Kitchen Bedroom Bathroom Magazine who gave us some lovely items to give away to our shoppers and workshoppers on the day. Special stall holder credit has to go to Libby of &Hobbs who arrived drill in hand and proceded to construct a mini recreation of her store out of plywood before our very eyes. Given that I am about as safe with a black & decker as I would be with a nuclear weapon I stood back like an astonished home owner during an episode of DIY SOS and just watched in sheer admiration as it came together. I think the moment when my mastercard breathed a huge sigh of relief and I was able to unclench my bum cheeks for the first time in 12 hours was at about 9:45 when a queue started to form on the pavement outside and the projects pots of Annie Sloan chalk paint we had for our first 20 customers disappeared quicker than a packet of malteasers left alone in a room with me. From there on in it all passed in kind of a blur, a little bit like your wedding day but with more opportunities to buy vintage French marmalade pots. I got to meet so many of the amazing people I have spent the last year chatting Shades of Grey and Soft Furnishing with over Instagram as well as lots of lovely people from the local area who had seen the gorgeous strawberries & cream bell tent belonging to The Glam Camping Co go up and had decided to come along and find out what was going on. 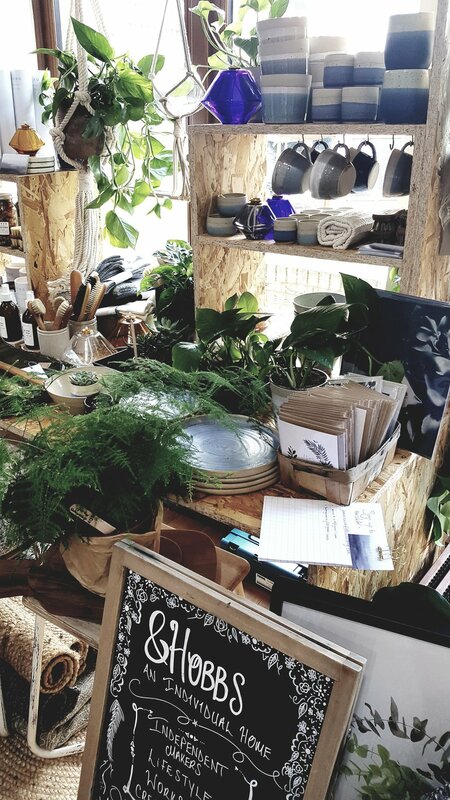 It was lovely to see people grabbing a coffee from Emily of We Are Here Coffee's super cute piaggio van, wondering around chatting, picking up flowers, hanging planters and terraniums from Love Flowers and then leaving the hall with bags full of bargains. It was even more amazing to meet people who had hopped in the car and set a course to N21 from as far afield as Nottingham (the Notts Massive of @Keeleytara @eclectic_street and @janemcwallace) and Norfolk. The lovely Amanda of @FordHouseNorfolk was greeted with a sweaty bear hug from me after arriving with tables for our workshop to save my bacon after I mistook Stowmarket for somewhere you can just nip to in your lunch hour to collect 4 e-bay card tables rather than a 3 hour roundtrip up and down the M11. Best lashes and hair on instagram @kelldon, Queens of the dark side who came north of the river @alexcrabtreepr and @deborahvos and the notts massive of @janemcwallace @keeleytara and @eclectic_street oh and me looking like an apprentice on her lunch break from a Butcher's counter. I have long oogled the instagram feed of Kinship Creative and watched in awe as she has transformed venues from 'Meh' to 'May I Move I move in Please' so I absolutely loved watching her turn our upstairs church meeting room from a tribute to beige into a Modern Rustic haven for our Occasional Home Store Workshop. It was attended by a gaggle of gorgeous ladies from all corners of the UK including Reena from @hygge_for_home (my modern rustic sister from another mother) who came from Cardiff, my co-hosts of #styleithappy (aka my internet hashtag brides) @comedowntothewoods and @thisstyle_rocks who were joined by birthday girl @the_girl_with_the_green_sofa and left Leeds at 5:30 am to join us, and not forgetting the lovely @SezHodson who picked up OHS airmiles by coming from Switzerland. Kate Watson Smyth deliverying her top ten tips to improve any room. With the dream team of Kay and Kate Watson Smyth aka interiors super blogger Mad About the House running the workshop I had to resist temptation to cast off my apron (which Sally and Beth totally pulled off but which lent me a certain air of #ButcherChic) and join in. Especially given there was a goodie bag which included a copy of EKBB as well as a whole host of treats from Of Special Interest Lisa Valentine Home, Annie Sloan, Pea Style, Norahs Brownies and Plum & Ashby. Going home a happy shopper after her talk, the gorgeous @mad_about_the_house with a @lisavalentinehome feather duster. 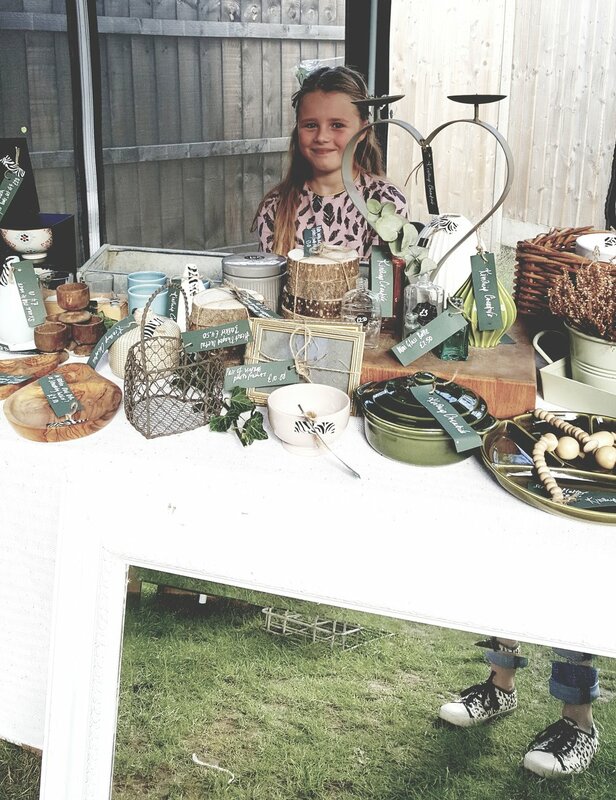 Whilst mum Kay was upstairs running our workshop daughte Bella aka Mini Kinship was downstairs running the family business behind the Kinship Creative stall. What we have loved, in the week following the event, is seeing the pictures people have been sharing on their instagram accounts of the things that they bought at the Occasional Home Store with lots of items having found some very nice new forever homes. It has also been lovely to read some of the reviews of the events from bloggers including 91 Magazine and Fabulous Places . @the_girl_with_the_green_soda displaying some of her lovely Occasional Home Store finds. Employees of Vintage Interiors Fagin aka my best friends.